We provide an amazing experience for any event! Add a chocolate or drink fountain to your wedding reception, graduation party, or business function and your guests will be delighted. 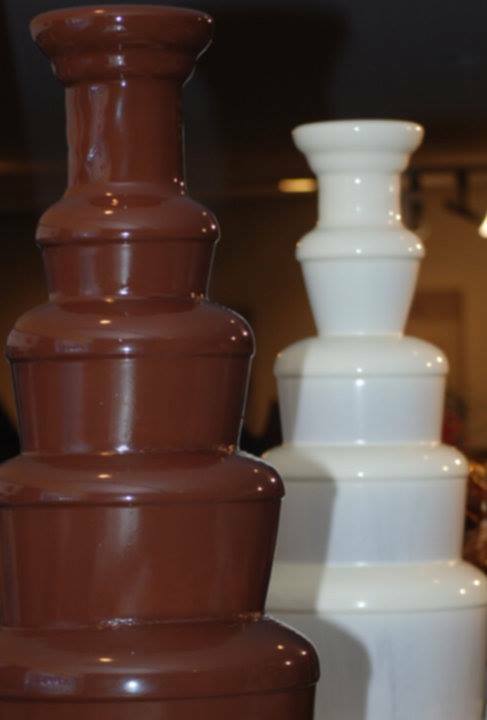 We provide the best Chocolate Fountain Rentals and Sales in Albany, Schenectady, Troy and beyond the Capital District. Now serving New England too! Make your next event sweeter with a chocolate fountain. All of our popular chocolate fountain rentals include a uniformed, friendly, professional attendant! We Do Fondue, LLC., provides a unique enhancement to any party or a special event with the addition of our Chocolate Fountains. With five different fountain sizes available for rent, there are no functions that we cannot accommodate. We have some ideas to offer for creating lasting memories at your special occasions. We Do Fondue for You! We love chocolate, you love chocolate, EVERYONE loves chocolate! At We Do Fondue, we are passionate about chocolate and want to bring that passion and enthusiasm to your event. At We Do Fondue we have five different fountain sizes for chocolate, drink fountains, and “bottomless” dipping items to accomodate any event you can imagine. We offer custom packages to help make your event a smashing success! Transform your event into a magical and memorable experience that will have your guests raving for years. Call us today so we can help you take your event to the next level! We Guarantee You Will Love Our Services! Contact us today, book your event, and we will help you create a unique experience! You really have to see the fountains in action to appreciate them fully. At We Do Fondue, we are dedicated to making your event special in every way! Wine, Cider, Punch! Imagine a Dark Chocolate Fountain dueling with a Red Wind Drinking Fountain...Amazing! Chocolate Fountains…We Love Them…You Love Them…Everyone Loves Them!